Why a NATURAL DEATH expo? The term ‘natural’ conjures up all kinds of ideas, thoughts and emotions in people. The very mention of the word “death” is uncomfortable and unpleasant enough for people, but coupling the word ‘death’ with the word ‘natural’ seems to imply that suffering, sadness and woe are inevitable and that no one would ever want a ‘natural’ death. Perhaps as some might view ‘natural’ birth as a process of being a martyr and suffering needlessly. 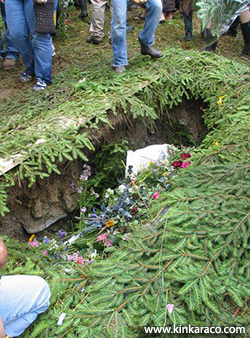 What is a NATURAL or GREEN burial? What is a GREEN or NATURAL funeral? A green funeral would be a funeral where the deceased person is not embalmed, or is embalmed using “green” or “natural” substances. It is also possible to keep a body cool for viewing using dry ice. A green funeral would be a funeral service where an emphasis would be placed on reducing the environmental footprint of the entire service. Currently, there is only one funeral home in Ontario specializing in green funerals and burials – eco Cremation & Burial Services. 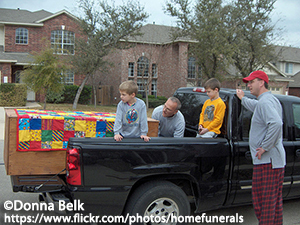 A home funeral is a viewing and/or funeral service that takes place in the home – just like it used to be 100 years ago or so. 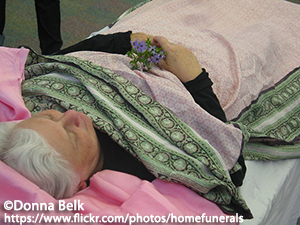 It is legal to have a home funeral in Ontario. Legal next of kin are able to claim the body of their dead loved one, and are able to register to death and obtain a burial permit on their own as well, though it is not yet common – in fact, is extremely rare – in Ontario at this time.